Today, I would like to sing the praises of one of my favorite bakeware companies, NordicWare. NordicWare, a family owned business based in Minnesota, manufactures absolutely gorgeous cake and loaf pans. Please note that these are just my opinions. I am not affiliated with NordicWare in any way nor am I being compensated by NordicWare for my opinions. I just love their products. First, NordicWare pans are great to look at. These snowflake cakelet pans are the newest addition to my collection. Aren't they beautiful? Just look at that detail. That level of detail is common in NordicWare pans and makes selecting a pan to buy very difficult. For example, check out the seashell pans. I made delightful almond shell cookies with these pans. Every detail was visible in the final cookie. Autumn is my favorite season so it stands to reason that most of my NordicWare is themed for fall. I couldn't pass up these acorn and maple leaf cakelet pans. What's fall without pumpkins? 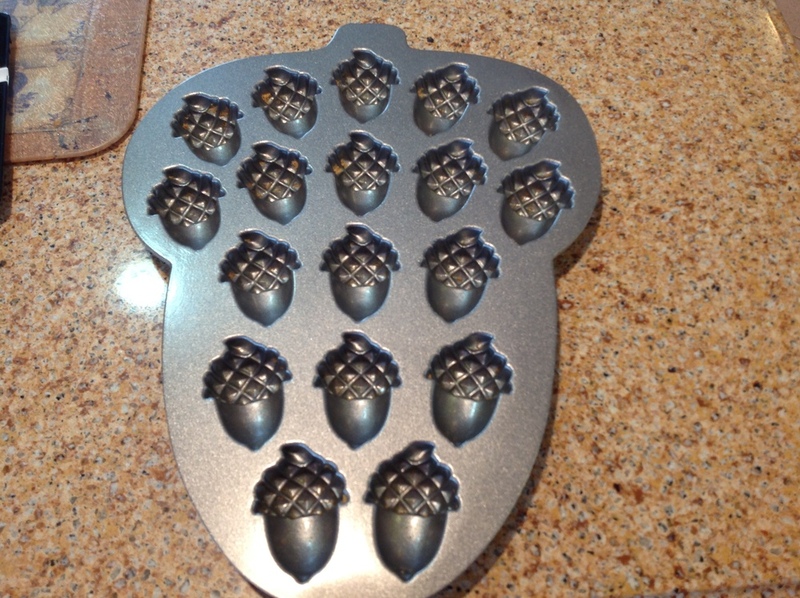 Pumpkin cranberry muffins just taste better when they are made in this pumpkin muffin pan. Notice the leaves on the ends of this muffin pan? NordicWare adds such beautiful details to its bakeware that you could use it for seasonal décor in the kitchen. Can't decide which autumnal shape you want? Choose this cakelet pan with wells shaped like pumpkins, acorns, pinecones and walnuts. I know what your thinking. With that level of detail, it must be difficult to get the final baked goods out of the pan. Thanks to a special coating, the cakelets and muffins coming out of these pans release easily with the full detail that you see on the pans. I have never had a problem with my cakes sticking to the pan and leaving the fine detail behind. So what you see on the pan is what you get on your cake, breads and other baked goods. NordicWare pans are made of heavy duty materials. The pans have heft to them; nothing flimsy here so when they are full of batter there will be no twisting or torqueing. And the sturdiness of the pans promotes even baking and carmelization. Finally, these pans are made in the USA! Yay! There is nothing I love more than supporting US companies that make their products right here. My collection of NordicWare is just the tip of the iceberg with the variety of their designs. Go to NordicWare's web site and check them out. The extent of the product line is astonishing IMO. So if you want to give a great gift to yourself which will help you turn out beautiful baked goods, consider adding some NordicWare to your kitchen.